This THP is about 5 miles NE of Trinidad, CA and within a few miles of Redwood National Park at an elevation of 600 to 1,450 feet. The THP area drains into the Maple Creek watershed which has been heavily clearcut by Green Diamond Resource Company in the past, and contains coastal cutthroat trout, steelhead, coho and chinook salmon. 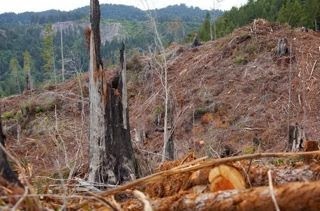 Green Diamond Resource Company is planning a mostly clearcut tractor and cable logging operation in redwood, Douglas fir, hemlock and grand fir forests. The THP area contains oversized units and steep streamside slopes in units B and D. Seven road drainage sites are planned for work including rocking, dip construction and culvert repair and maintenance. There is a marbled murrelet stand within 300 feet of unit A, and .25 miles from a haul road. More information is available on the THP Tracking Center website.